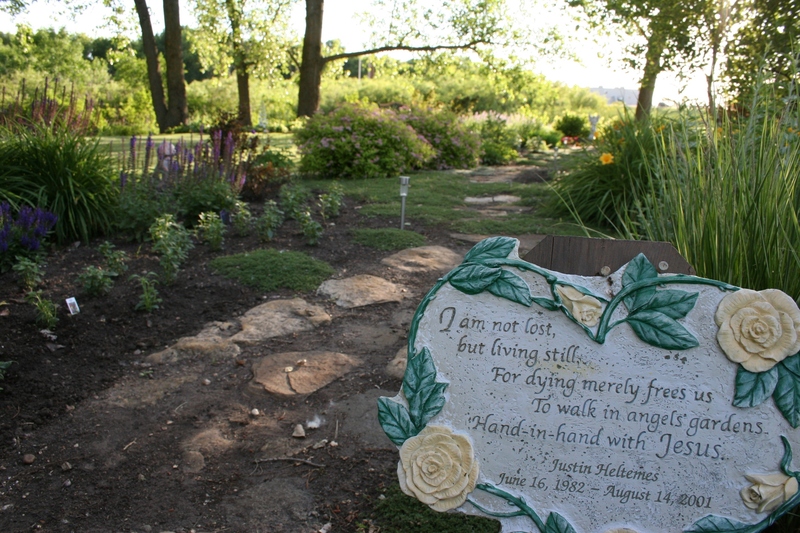 A plaque marks the entry to Justin’s Memory Garden. 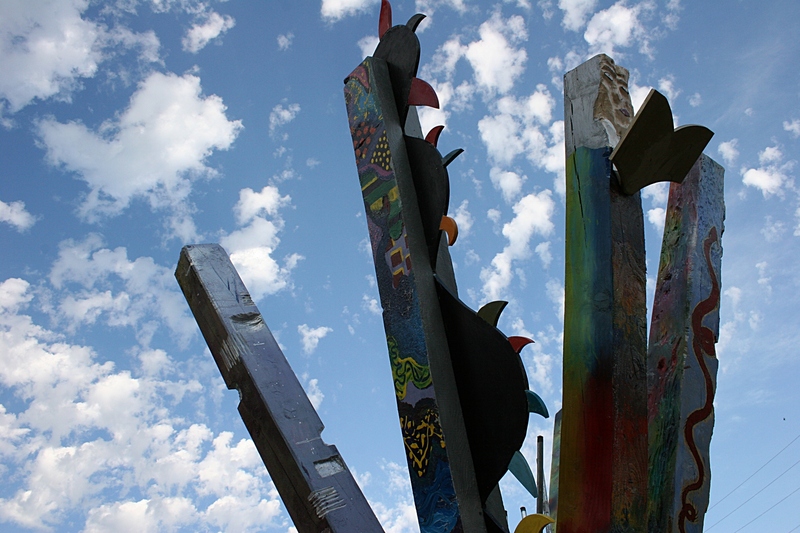 I NEVER IMAGINED, when I published a post here on June 16 about the Memory Garden which honors my nephew Justin, that you, dear readers, would so fervently embrace a sculpture from that garden. But I suppose my enthusiasm for the little boy holding a jar of fireflies ignited in the words I wrote. Now, because of that story and accompanying photos, five more gardens—four in southeastern Minnesota and one at a Colorado hospital—will become homes for the little boy. My husband, Randy, and Little Justin on the back steps before I moved Justin to a spot on the patio by the brilliant pink wave petunias. 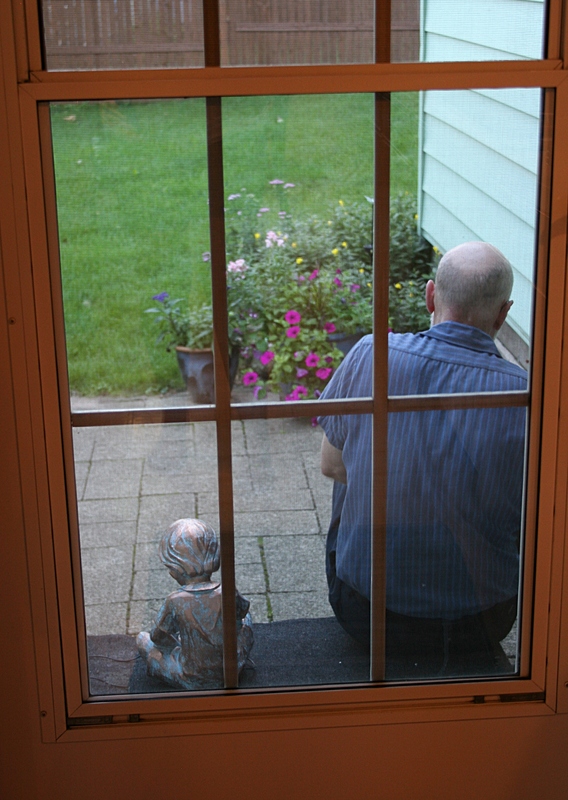 He’s already in my backyard, my Little Justin, as Justin’s uncle, my husband, calls the garden sculpture. Every evening as darkness settles in, the fireflies in the jar begin to glow, reminding me of my nephew who died too soon of Hodgkin’s disease 11 years ago at the age of 19. Fireflies glow in the sculpture I recently purchased in memory of my nephew Justin. He didn’t want us to plant a tree in a particular spot because it would ruin the sightline for the sunsets—we never have planted one there. Though we never talked about it specifically, he enjoyed light, from the heavens, in various forms. 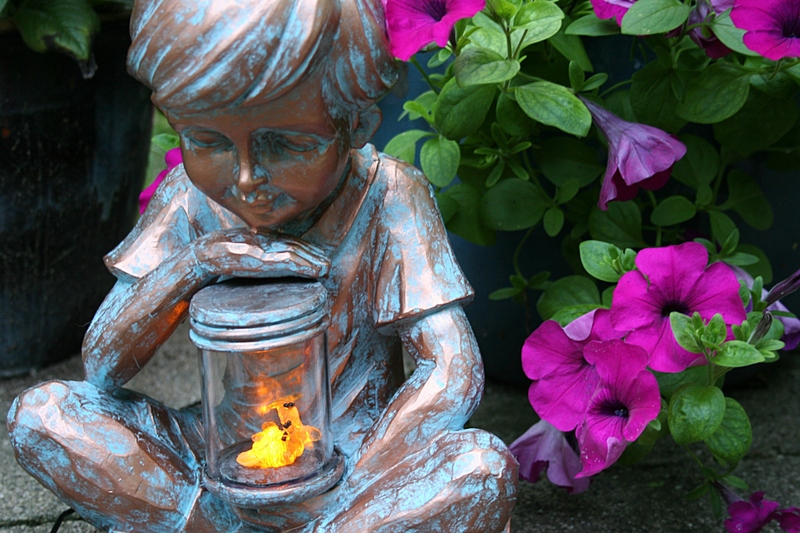 And so, when the mother of the boy who loved light and fireflies and the heavens, saw the “Lightning Bugs with Boy” sculpture in a brochure the day before Mother’s Day, she felt moved to purchase it for Justin’s Memory Garden. “As I’ve gotten older, I follow those instincts more readily,” Vivian says. 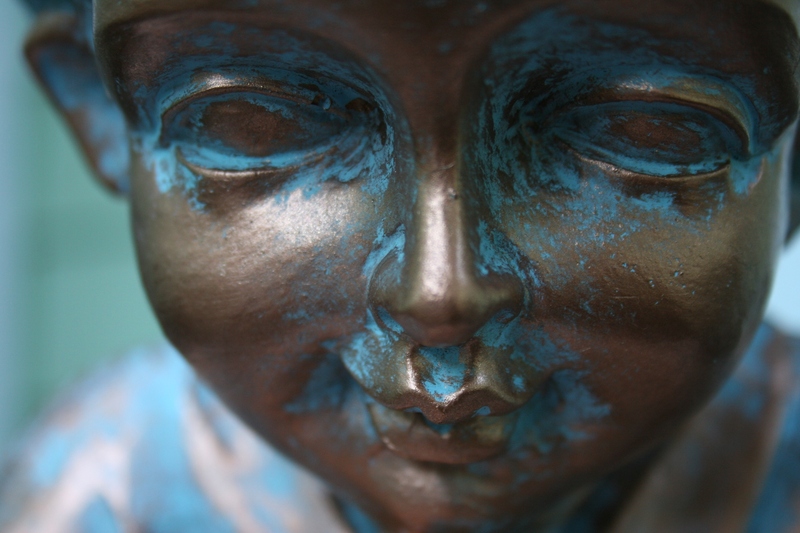 It is the first sculpture she’s purchased for the garden that honors her son. The other garden art—a plaque, dove, angel and birth bath—have come from friends as have most of the plants. That, she says, makes it a true Memory Garden. If you’re one of the gardeners who has purchased/is purchasing a Little Justin, hold close this story and imagine the little boy who loved light and is now living in the light. A close-up of my Little Justin’s endearing face. FYI: Vivian and I both ordered our “Lightning Bugs with Boy” sculptures from our local True Value hardware stores, hers in Morris, mine in Faribault. My sculpture had to be shipped in from Oregon. The product cannot be ordered online from True Value, but if you would like to view it, click here. 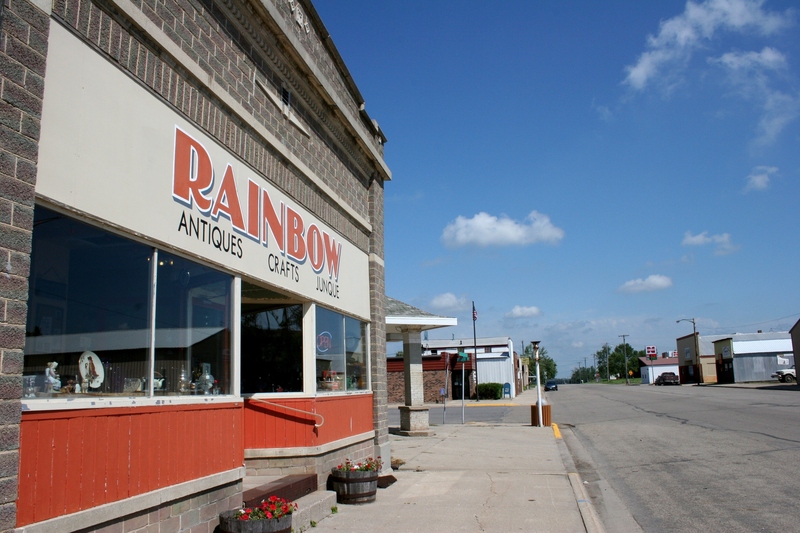 TWO REDWOOD COUNTY COMMUNITIES will come together to celebrate this Sunday, one year to the date after severe storms ripped through this region of southwestern Minnesota. 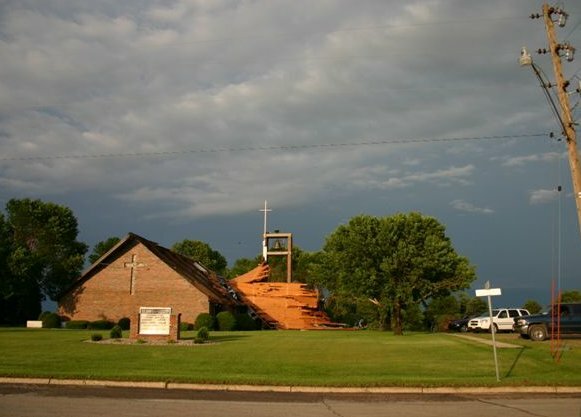 St. John’s Lutheran Church in Vesta, hours after a July 1, 2011, storm ripped half the roof from the sanctuary. Photo courtesy of Brian Kletscher. In my hometown of Vesta, area residents will remember the storm anniversary and rededicate St. John’s Evangelical Lutheran Church at a 10:30 a.m. worship service followed by a catered chicken dinner. 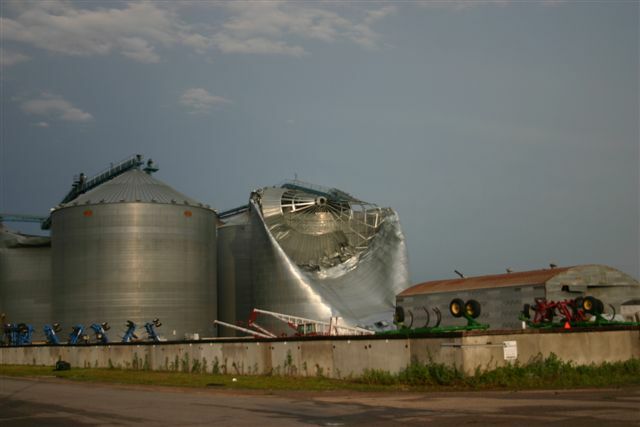 Damage to one of the grain bins at the local elevator. Photo by Brian Kletscher. 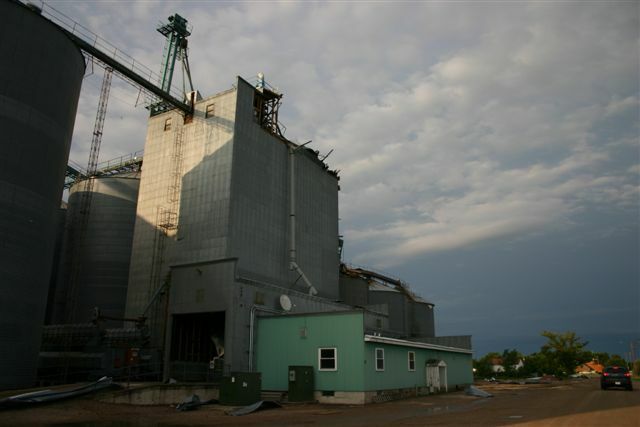 During the late afternoon of July 1, 2011, a series of downbursts with wind speeds of 90 – 100 mph swept through Vesta, ripping half the roof from St. John’s sanctuary, felling trees, denting grain bins, damaging the landmark grain elevator and more. 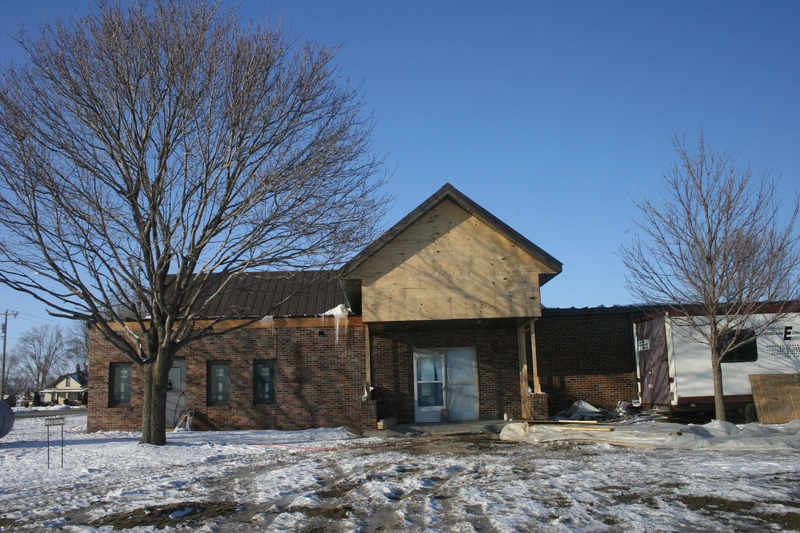 Under construction in March, a pastor’s office, bathroom and storage room were added to the south side of the early 1970s era church. Photo by Audrey Kletscher Helbling. It took nearly a year for St. John’s to reopen after the congregation decided to expand the church as part of the roof reconstruction process. Entering Belview from Sacred Heart at 9 a.m. on July 2, the morning after the tornado. Photo courtesy of Merlin and Iylene Kletscher, who were not yet living in Belview when the storm hit. In Belview, about 10 miles to the north and east, residents will also mark the one-year anniversary of an EF-1 tornado which rode in on the same storm system. The tornado, with winds of 95 – 105 mph, wiped out many of this prairie town’s trees (which fell onto buildings and vehicles), damaged the nursing home to the point that it closed for awhile, wrecked roofs and more. 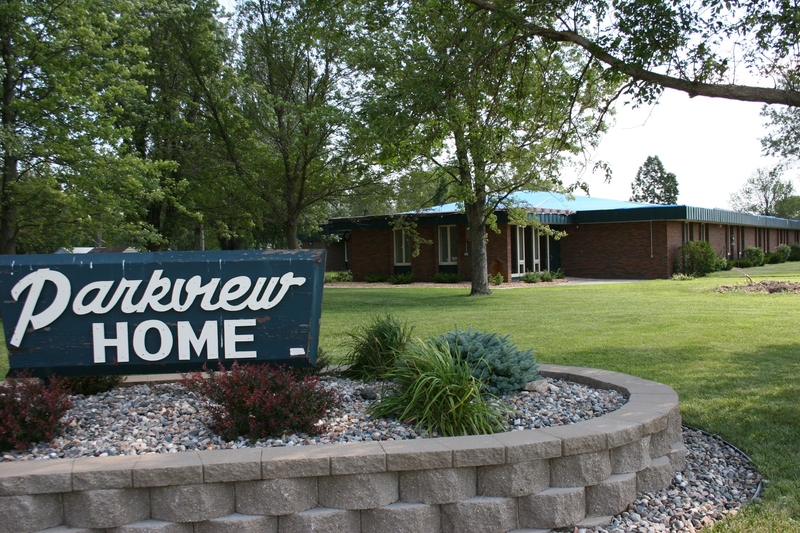 A month after the tornado, Belview’s Parkview Home (nursing home) remained closed as repairs were needed to the damaged roof, covered here with blue tarps. Photo by Audrey Kletscher Helbling. 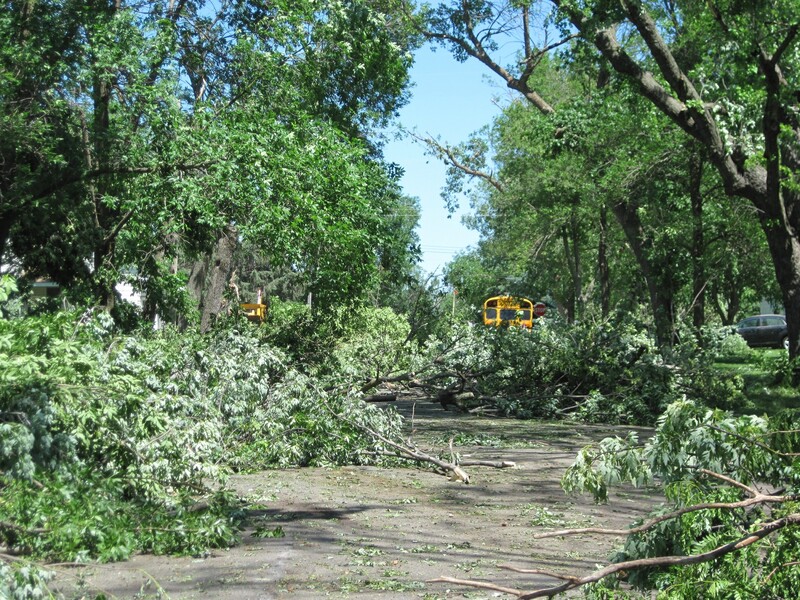 The communities of Belview and Vesta lost many trees in the July 1 storms. This photo is along a Belview street north of the park. Photo courtesy of Merlin and Iylene Kletscher. Jerry Hagen’s house, across the street from Merlin and Iylene’s home in a July 2 photo. Photo courtesy of Merlin & Iylene Kletscher. Damage along South Main Street in Belview. Photo courtesy of Merlin and Iylene Kletscher. A year later, Belview residents are celebrating with a catered community picnic supper and entertainment at the local park (or in the air conditioned historic Odeon Hall if the weather is too hot) from 4 p.m. – 6 p.m. Sunday. My Uncle Merlin and Aunt Iylene Kletscher will be among Belview residents attending that picnic, celebrating and listening to the music of Ron and Kathy and Friends. The Kletschers had just closed on the purchase of a foreclosed fixer-upper home along Belview’s Main Street when the tornado ravaged Iylene’s hometown. They lost most of their trees—one of the reasons the couple bought the property—and sustained damage to their house, which they had just begun renovating. So far we have planted four flowering crabs, a new disease resistant elm tree, 13 lilac bushes and the city has the Main Street boulevard planted with really nice-sized maples. We have two churches with new roofs, the bank is putting a new roof on right now and there are also more homes in the process of new shingles, etc., now. One year later, Belview is looking pretty darn good! 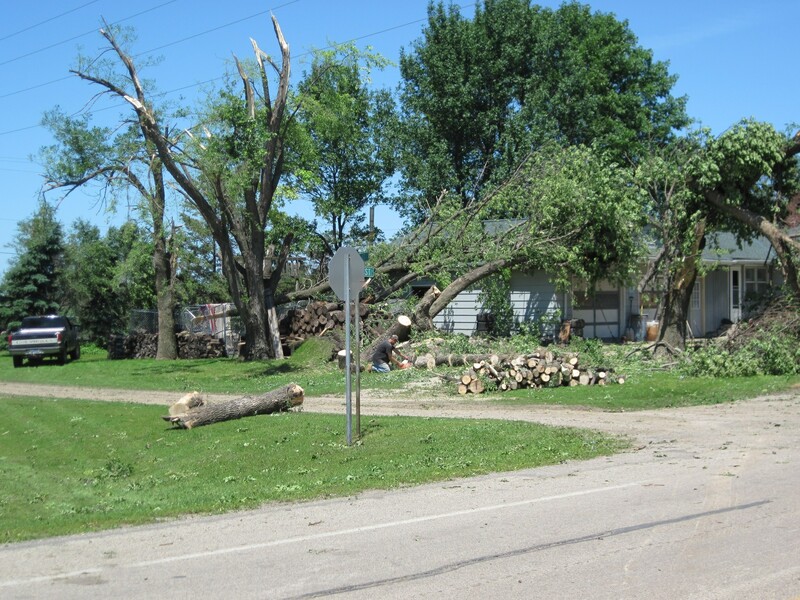 FYI: To read more about the July 1, 2011, storms and to view more storm damage photos, check the Minnesota Prairie Roots archives from July 2011. In addition to the damage in Vesta and Belview, many rural residences also were hit. The farm of my cousins, Danny and Marilyn Schmidt, was struck by a second EF-1 tornado which nipped the northwestern corner of Redwood County. 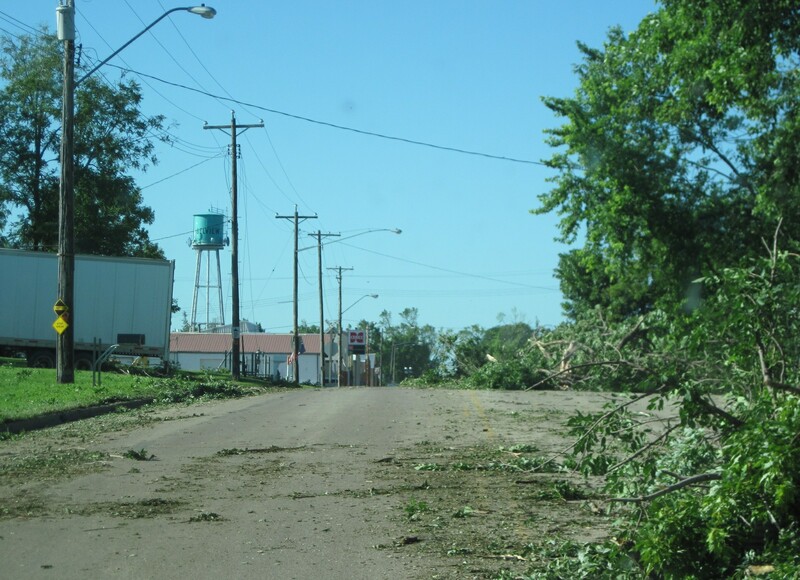 Near the South Dakota/Minnesota border, the community of Tyler experienced an EF-2 tornado which followed a 3-mile path through Lincoln County. 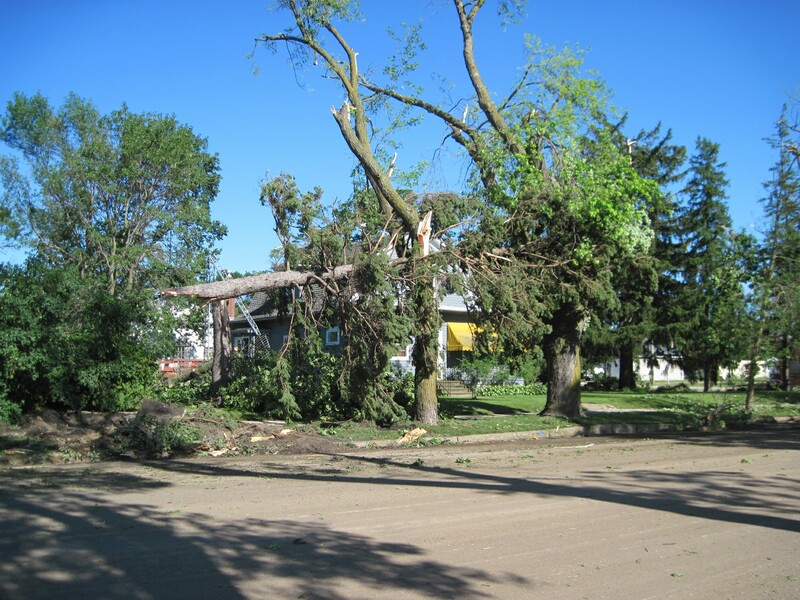 The tornadoes and wind storms were part of a massive storm system on July 1, 2011, which began along the western edge of Minnesota and extended as far east as northwestern Wisconsin. I was on my way with my husband to a party near Nerstrand not far from our Faribault home in southeastern Minnesota when these threatening clouds moved in during the early evening hours of July 1, 2011. 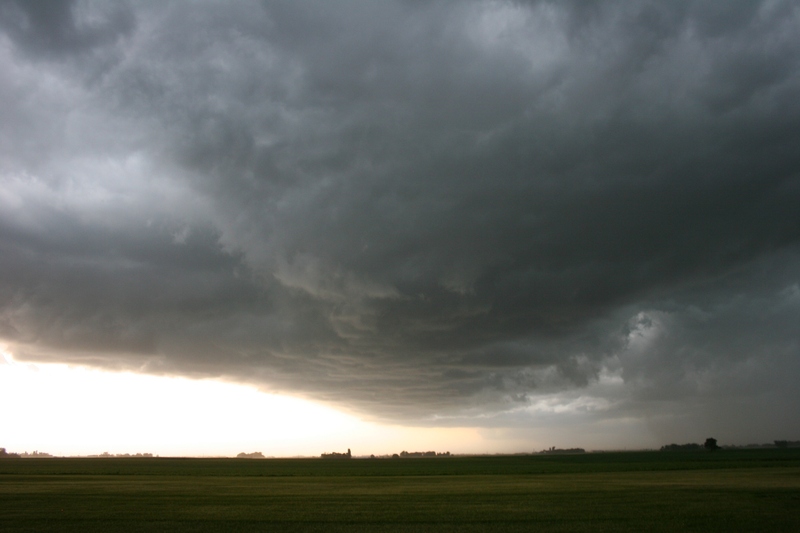 It was while driving to our friends’ rural home that my sister Lanae phoned to tell me about the storm in our hometown and to warn me of the approaching bad weather. Fortunately the ominous clouds delivered only rain and nothing severe. But I was worried, very worried. 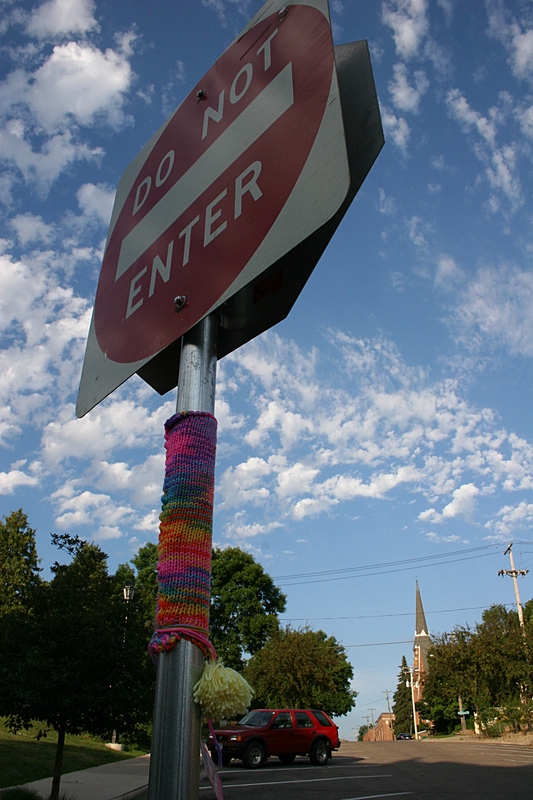 HOT, HUMID WEATHER can cause all sorts of issues. Frizzy hair. Over-taxed air conditioners. Crabby kids, and adults. Buckling pavement. 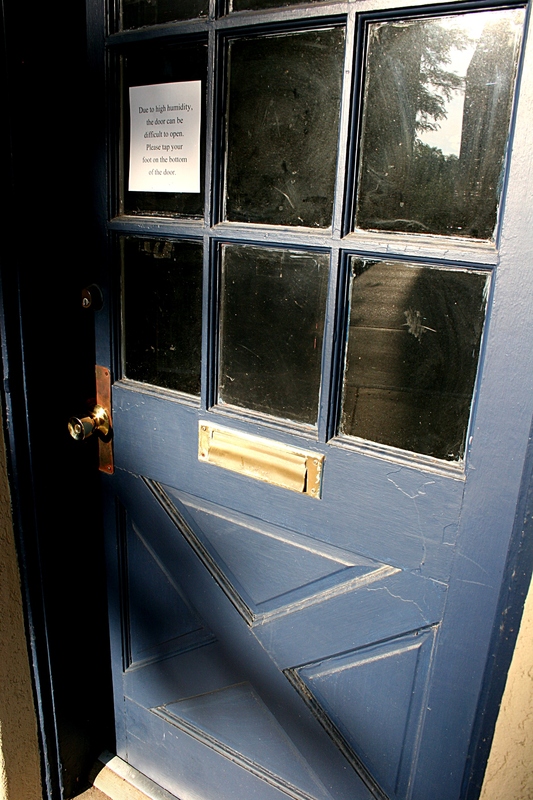 The door to Personal Touch Office Services. 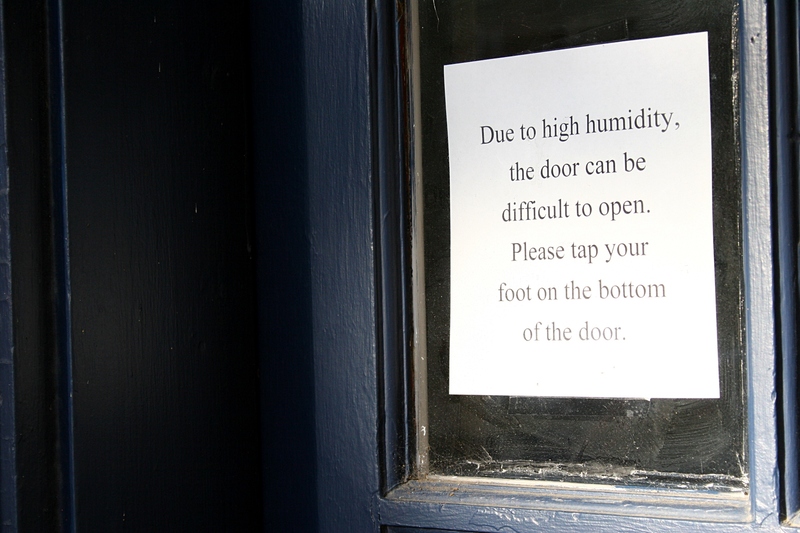 Follow the instructions to get the door open during humid weather. Please note that Patti instructs you to “tap,” not kick, the door. Got that? I expect door tapping kicking has been a popular sport in Minnesota this week. FYI: I do not know Patti nor have I ever done business with her. I simply found her note amusing and wanted to share it with you. 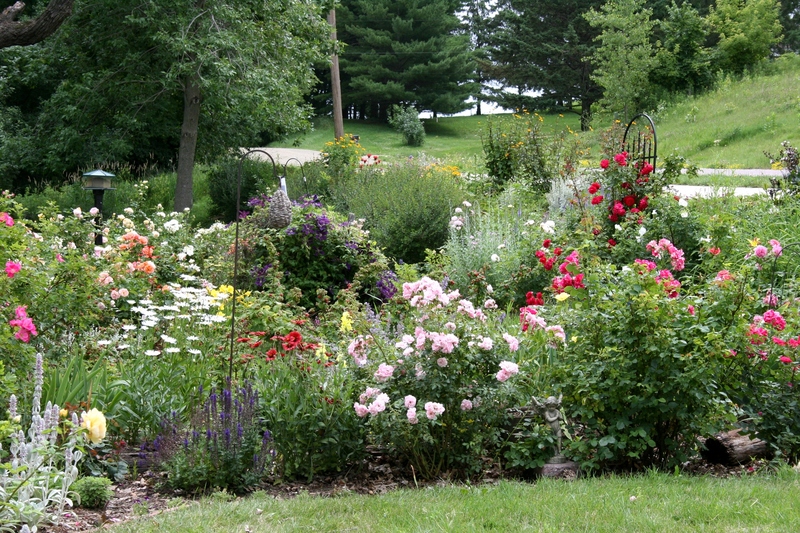 This overview shows you the size of Margaret’s sprawling flower garden on Faribault’s east side. OH, WHAT AN ABSOLUTE JOY to be Margaret’s neighbor, to gaze across the street into her flower garden reminiscent of a Claude Monet painting. But, alas, I live down the hill, over the river and into the valley across town from this eastside Faribault garden. I happened upon Margaret’s sprawling, Impressionist style garden on a recent Saturday morning. And because I’m not at all shy, I popped out of the van and approached Margaret as she weeded her flowers. 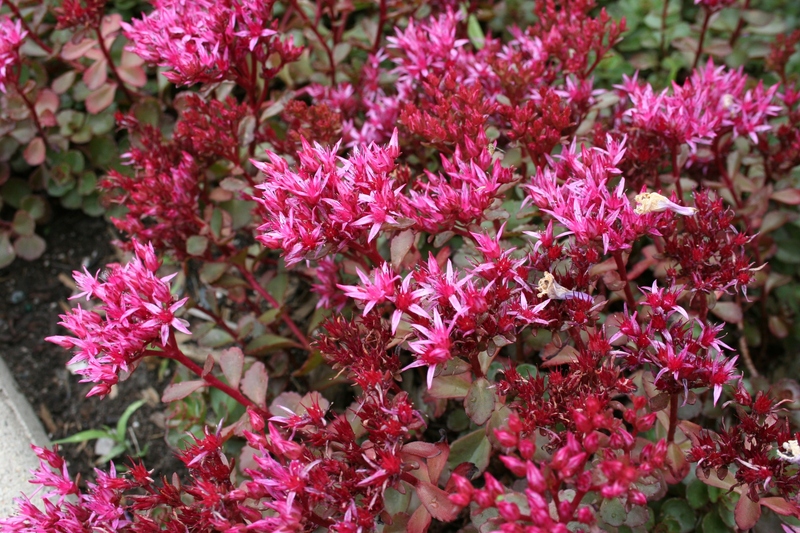 Low-lying fuchsia sedum add a jolt of brilliant color. Loved these dainty, pale pink flowers. 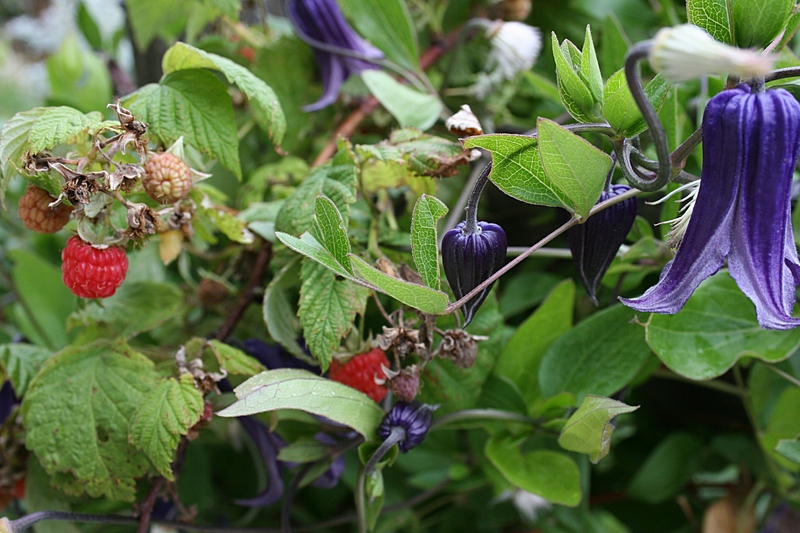 Gardeners, what are they? No, I couldn’t ask Margaret to identify every single plant. Margaret didn’t tell me I couldn’t photograph her hand. She kept working while we talked, bucket of tools nearby. She had more gardening tools in the garage, she said. 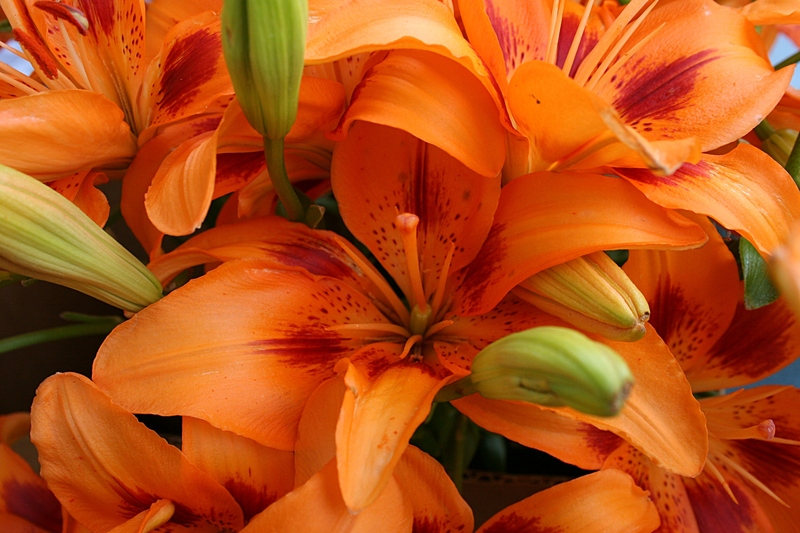 Margaret knows her flowers and her passion for them is irrepressible. She simply loves to garden. That’s apparent as her flower garden stretches nearly the entire 180-foot length of her and her husband’s lot and then extends 30 – 40 feet from the edge of the sidewalk, down the slope and to the garage. 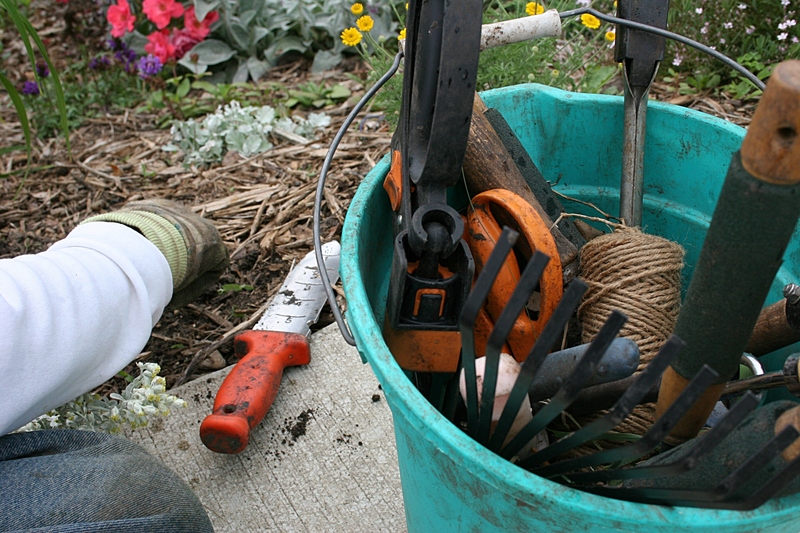 She began planting the garden about five years ago, partially so her husband wouldn’t need to mow the slope of the lawn. From daisies to bee balm, sedum to clematis, lamb’s ears to lilies and dozens of other perennials, Margaret’s garden is awash in color and blooms. Her pride and joy, though, are her 50 some rose bushes. 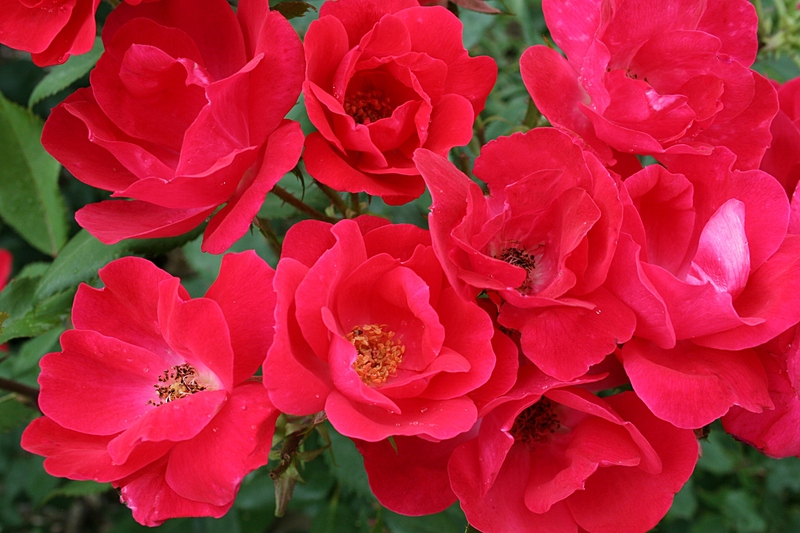 Margaret’s garden is a rose lover’s paradise. Roses and more abloom with pieces of art tucked in among the flowers. One of the many English rose bushes, which are Margaret’s favorite for their thick layers of petals and scent. 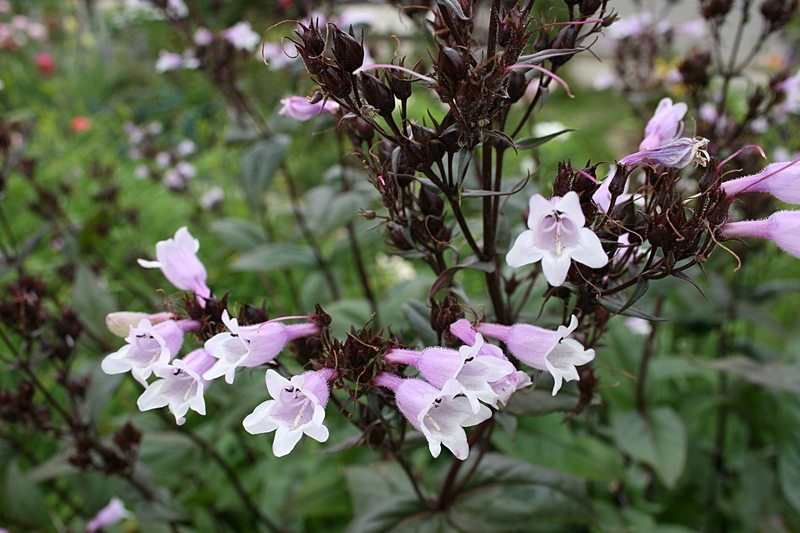 I roamed the perimeter of the garden, snapping photos as rain pittered and hastened my photo shoot. 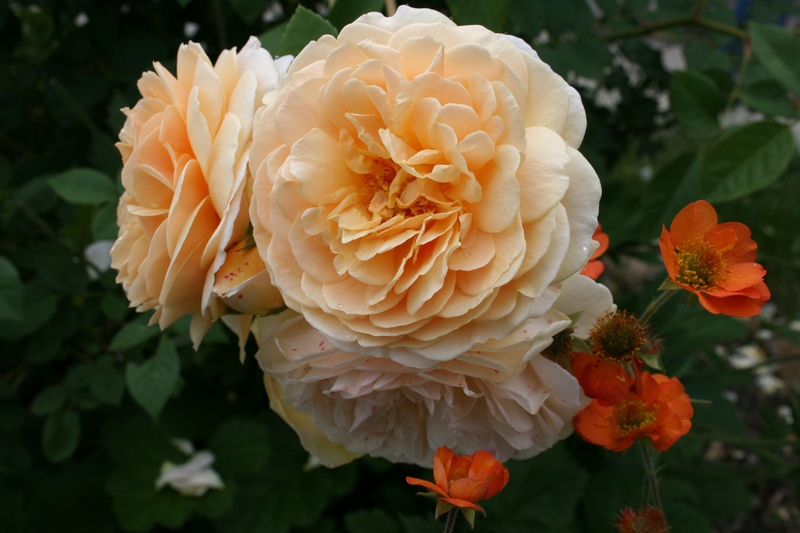 Yet, I took time to inhale the heady perfume of Margaret’s beloved English roses. 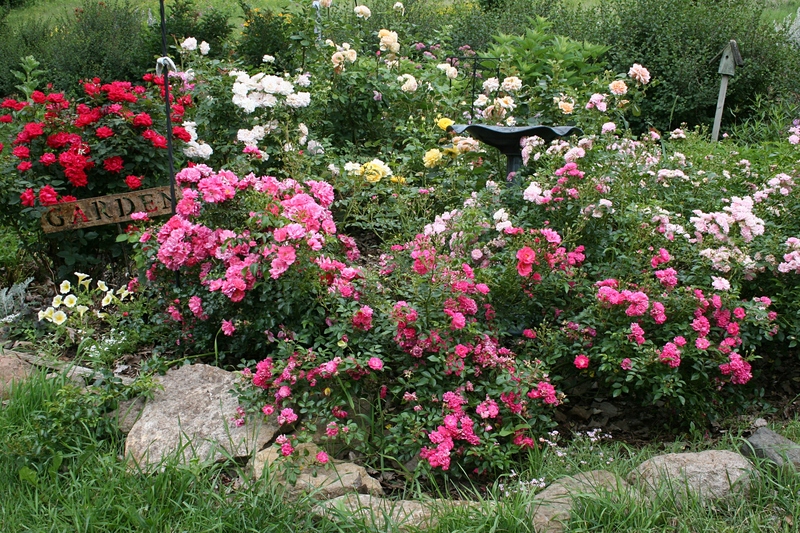 English and shrub rose bushes compromise most of the roses in her garden. The most gorgeous clematis I’ve ever seen, in full bloom. 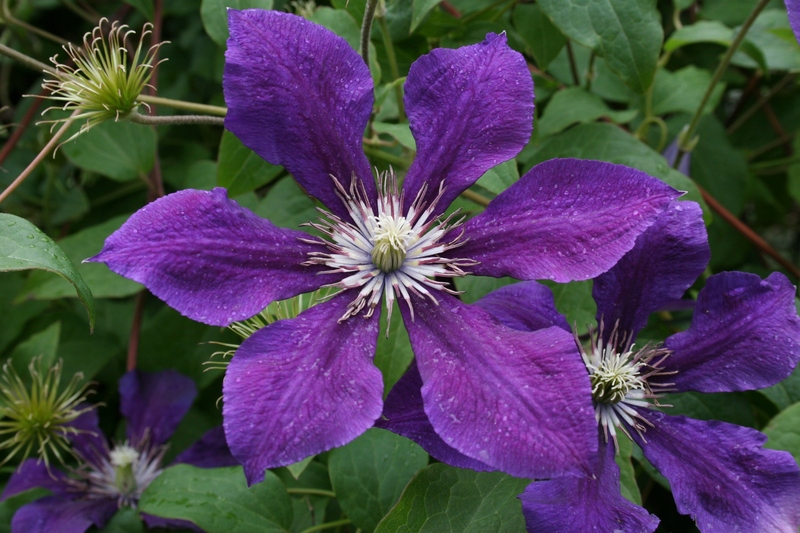 Just look at Margaret’s eye for color, pairing purple clematis and coral roses. 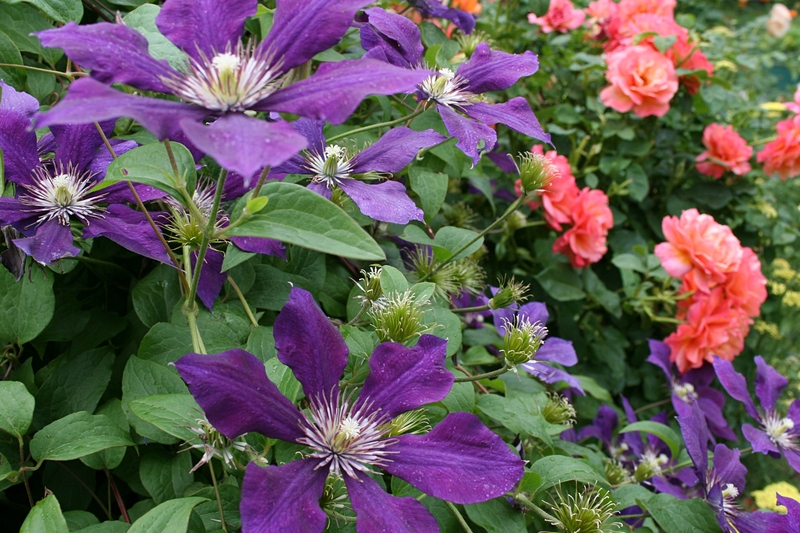 I noticed this gardener’s talent for pairing colors—especially the striking contrast of royal purple clematis next to coral-hued roses. 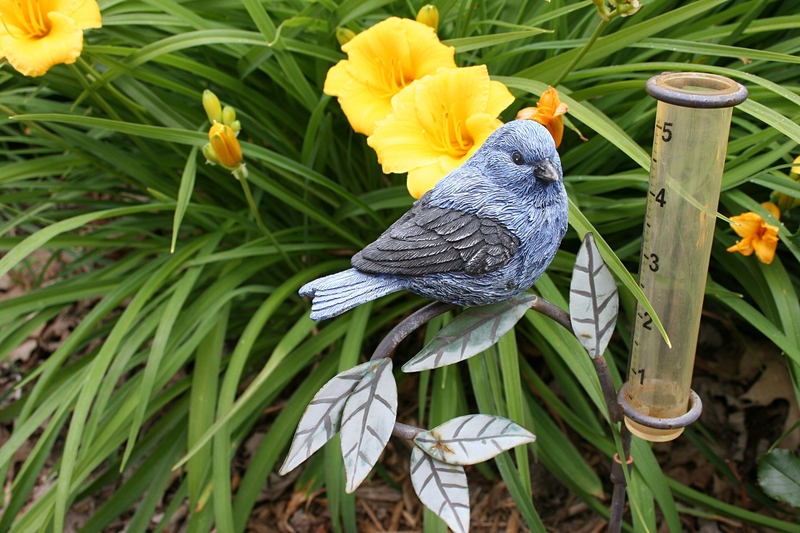 Who knew a rain gauge could also be a piece of garden art staked next to lilies? I appreciated, too, how she tucks garden art among her flowers with the skills of a designer. A snippet overview of a portion of Margaret’s Monet garden. If Margaret’s garden was a painting, surely it would be a Monet. Margaret mixes the jewel tones of raspberries with flowers. She’s also incorporated strawberries and tomatoes into her flower garden. 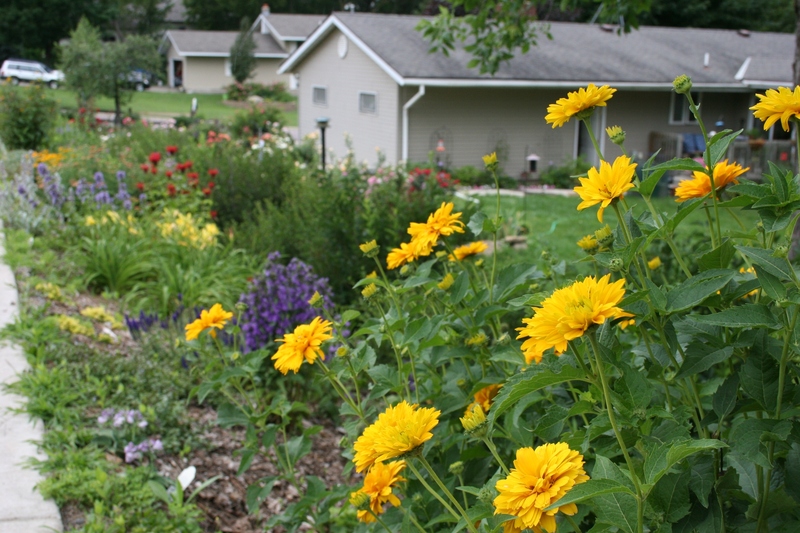 FYI: Margaret’s garden is located at 1325 11th Avenue Northeast, Faribault. 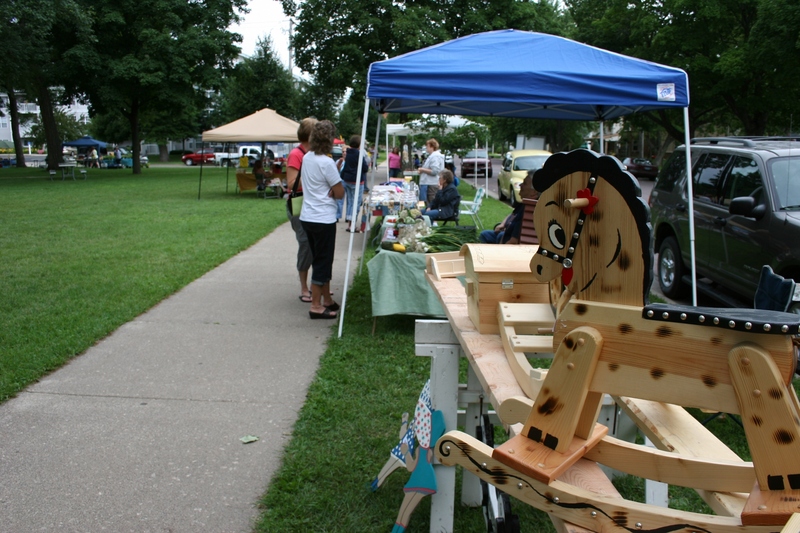 A snippet of the Faribault Farmers’ Market on Saturday morning. 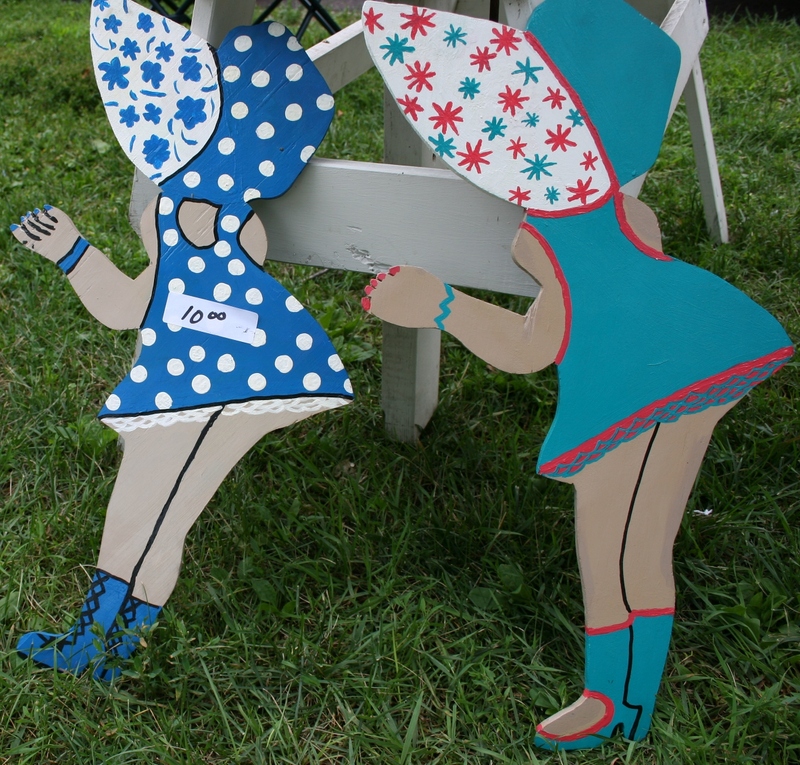 IT IS A PLACE of conversation and crafty creations, of canned garden goods and garden fresh produce, of homemade breads and muffins and sweet treats. That, my friends, defines the Faribault Farmers’ Market in one swoop of a summary sentence. 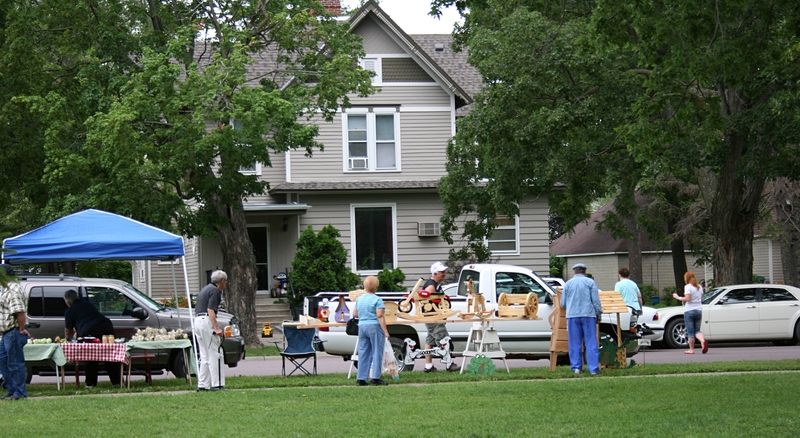 Break that sentence down and you will meet Ken, the weaver; Bernie, the woodcrafter; Judy, the card maker; Sandi, the gardener; Denny, the candy maker; Rhonda, the crafter; Pat, the re-purposer of stuff; and many more vendors. 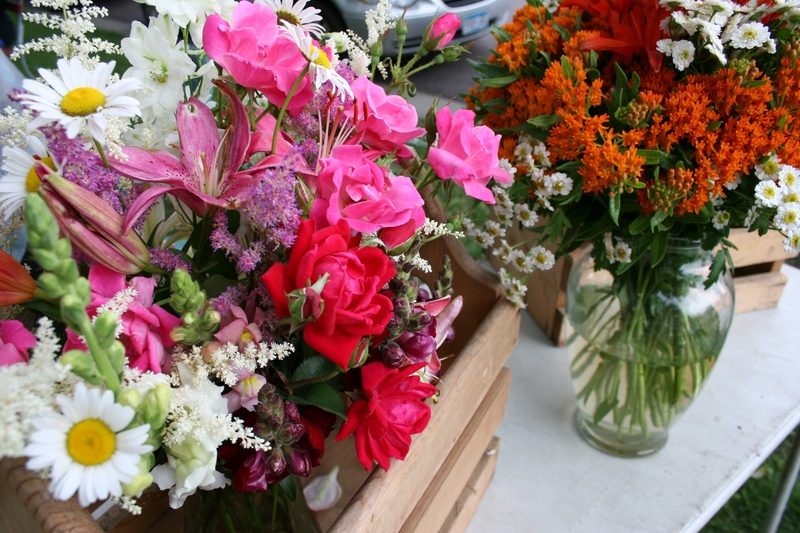 Saturday morning my husband and I shopped our local farmers’ market in Faribault’s Central Park because we appreciate these folks who work with their hands to bring us all that edible goodness, all those crafty creations, all those beautiful flowers and more. 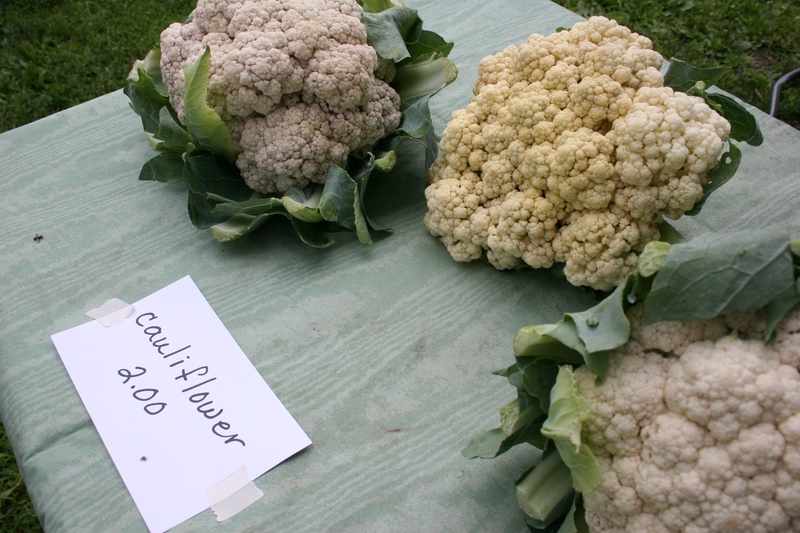 Cauliflower, from the chemical-free fields of a market vendor, in its natural, sun-exposed color. More market flowers from a vendor who always sells beautiful, mixed bouquets. We purchased Swiss chard, a bag of mixed green lettuce, red potatoes, cauliflower, a card to celebrate the birth of our new great nephew and four salted peanut bars, all for $12.25. 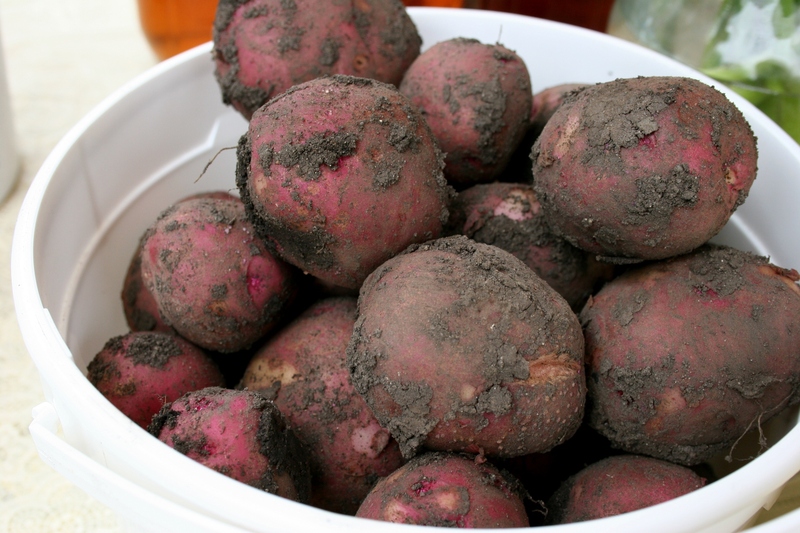 The red potatoes we purchased from Sandi, who planted her potatoes on April 13. But the value of our shopping experience expands beyond our purchases. The value lies also in engaging with our community, with those who are our neighbors and friends and with those who become our friends through our conversations at the market. 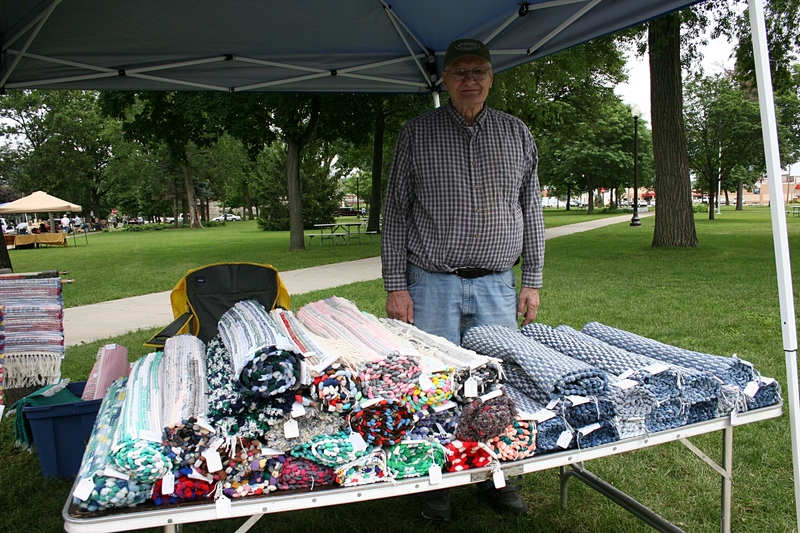 Ken of Wegner Weavers weaves these tightly woven, superb quality rugs, runners, placemats and coasters. After chatting with Ken, the weaver, I was blessed with one of the nicest compliments I’ve ever received. Ken didn’t know me except as an occasional shopper. But he told me how much he enjoyed our visit, that I spoke in a comforting way. And, you know, I nearly cried for the unsolicited kindness of the weaver’s words weaving into my heart. 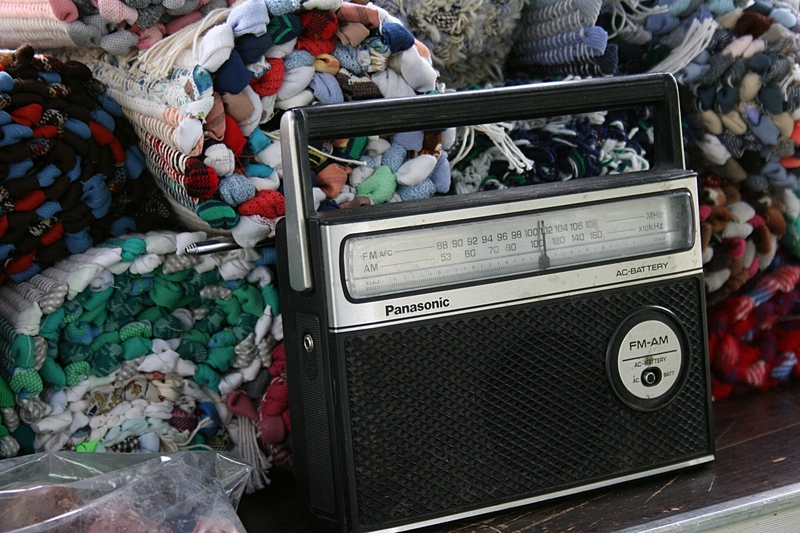 The vintage portable radio Ken, the weaver, brings with him to the market. In my opinion, Ken doesn’t need a radio; he makes music with his words. He says he doesn’t play the radio often as it can detract from business. Satisfied customers leave the market with fresh onions. 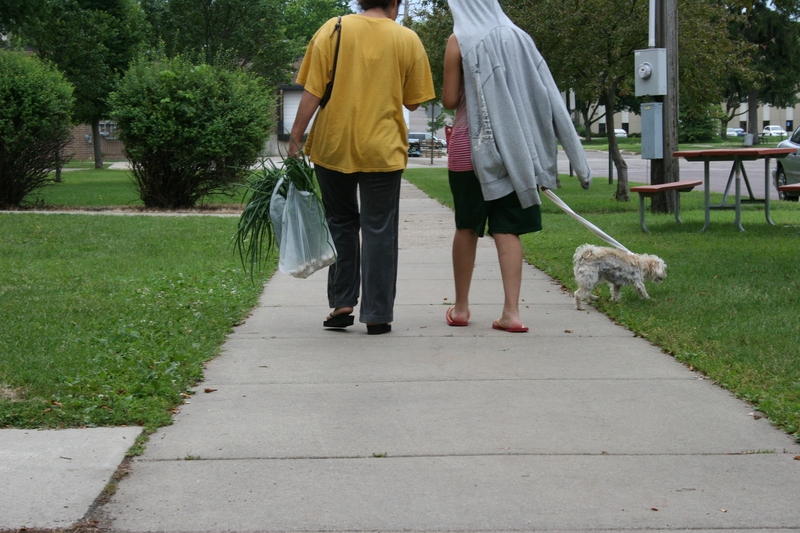 FYI: The Faribault Farmers’ Market is open from 7 a.m. – noon on Saturdays. 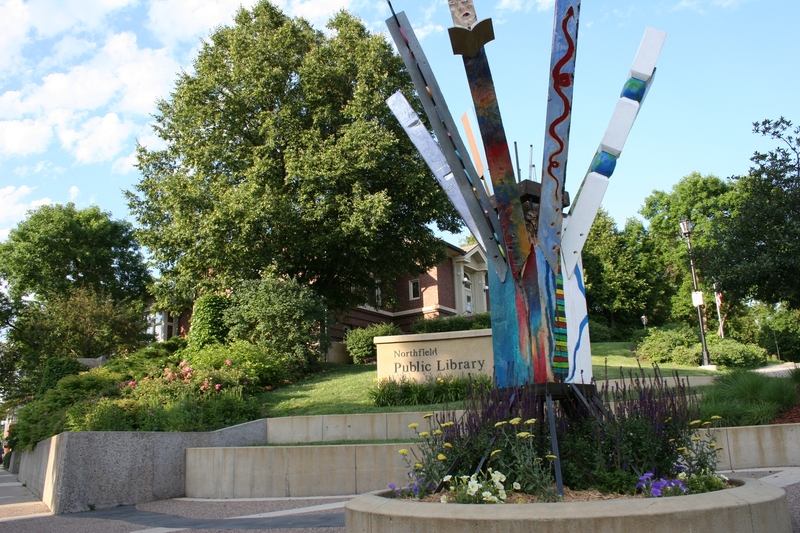 Beginning on July 11, it will also be open from 1:30 p.m. – 5 p.m. Wednesdays. 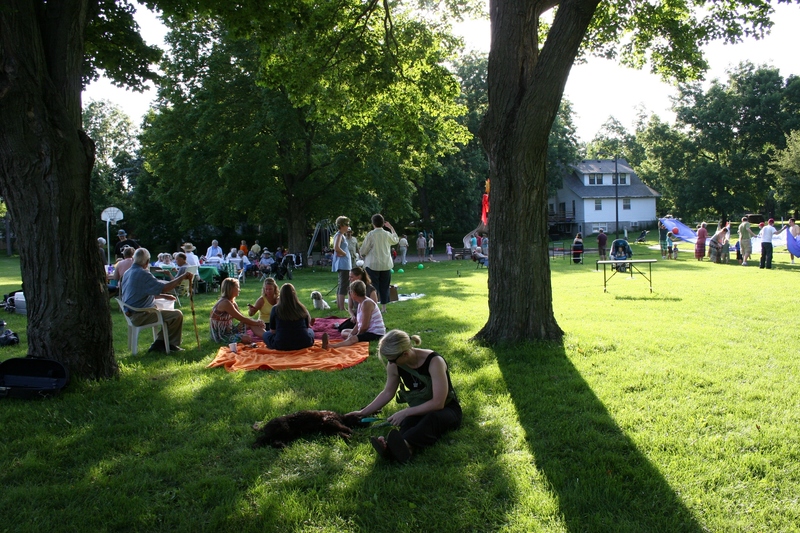 Picnicking, playing and celebrating in Way Park, Northfield, Minnesota, on Sunday evening. WHEN YOU VIEW THIS SCENE, what do you see? A bunch of people in a park on a summer evening, right? 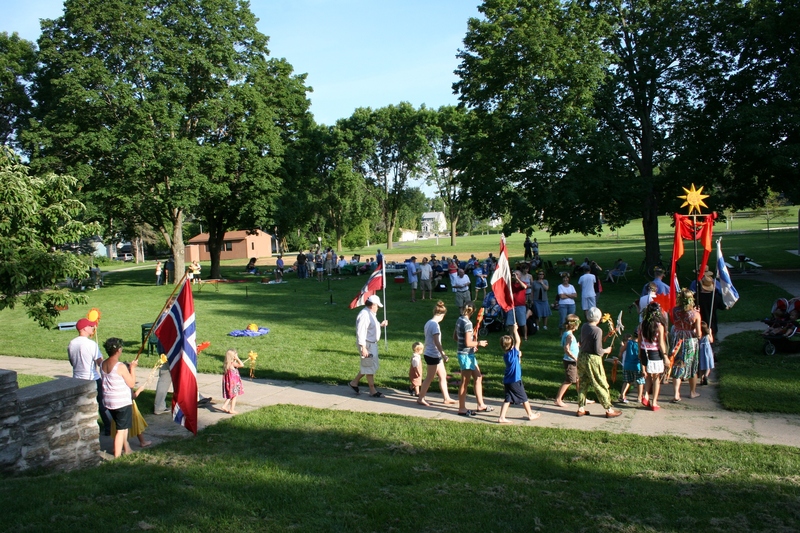 A procession of celebrants parade toward a center area where a maypole will be placed and dancing will follow. Here’s another photo from the same park, same June Sunday evening. But this is different. You notice flags and other festive details in what appears to be an organized parade. And you would be right. 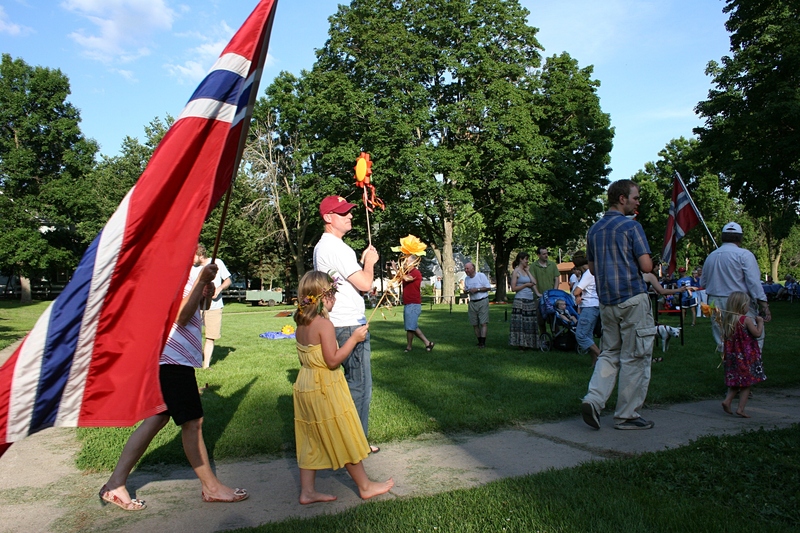 Both photos were taken at the annual Scandinavian Midsommar celebration at Way Park in Northfield and hosted by Friends of Way Park, the Northfield Swedish Club and Sons of Norway. That second image shows a parade leading up to dancing around a maypole. It’s easy, when a mass of people gather like this, to miss the details. But it is the details which define our lives, our personalities, our days, or celebrations. I looked for those details at Northfield’s Midsommar fest and, as always, delight in sharing my photographic observations with you. I’d encourage you, always, to see and appreciate the details in life whether you’re Scandinavian, German, Latino or any heritage in between. The Norwegian flag had a prominent place in the parade. 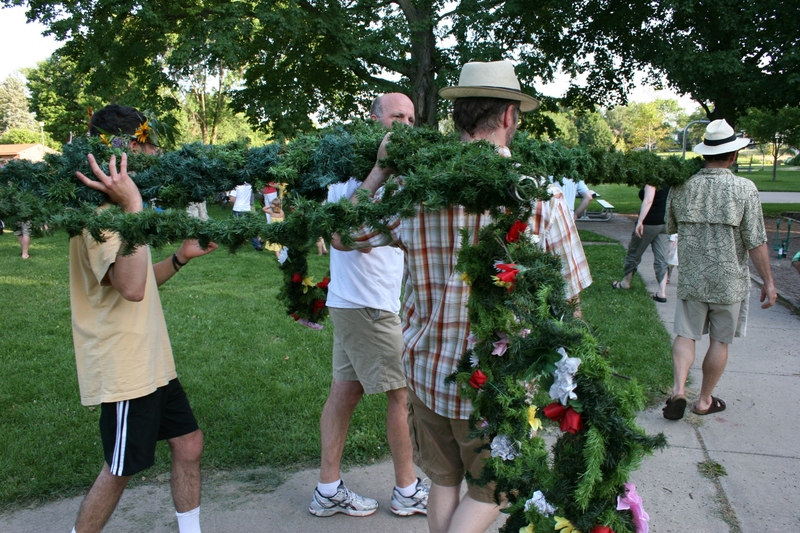 It took several good men to carry the maypole to the center of the festivities. 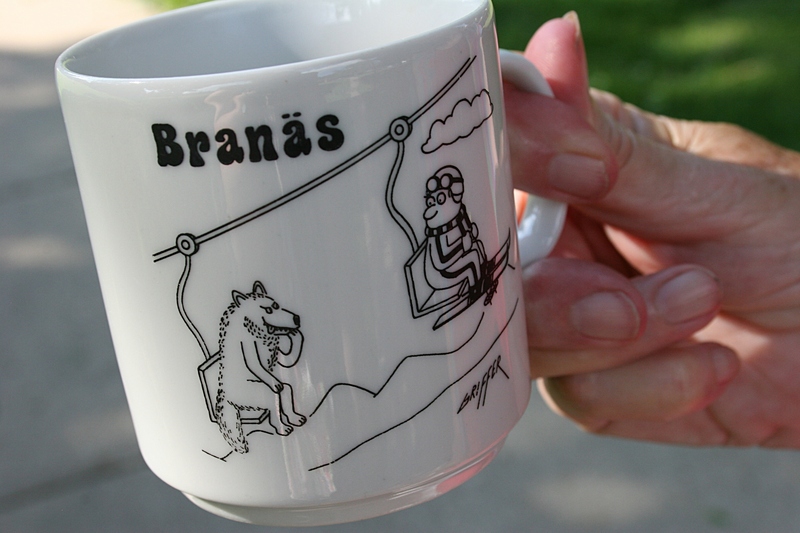 Lola, who is 100 percent Swedish, brought a mug from her ancestral home of Branas, filled it with coffee and munched on Krumkake (a Swedish sweet treat). Branas is a well-known ski area. 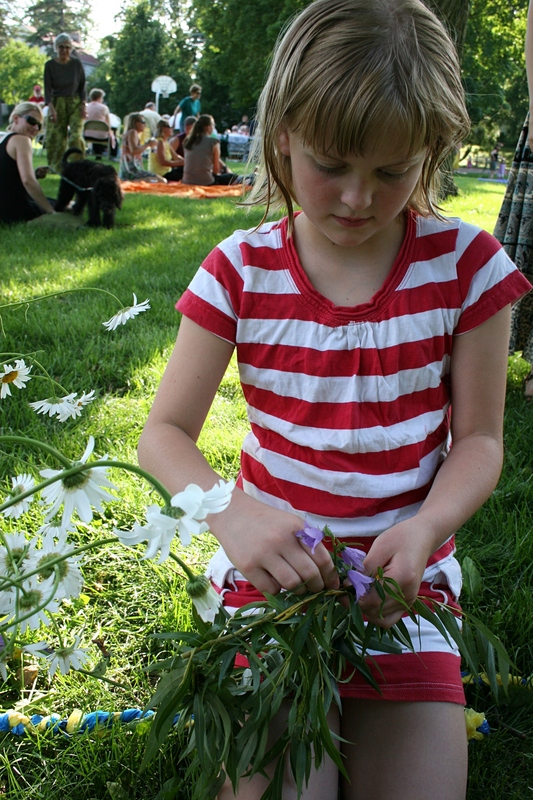 Weaving wreaths from willow and flowers proved a popular activity. 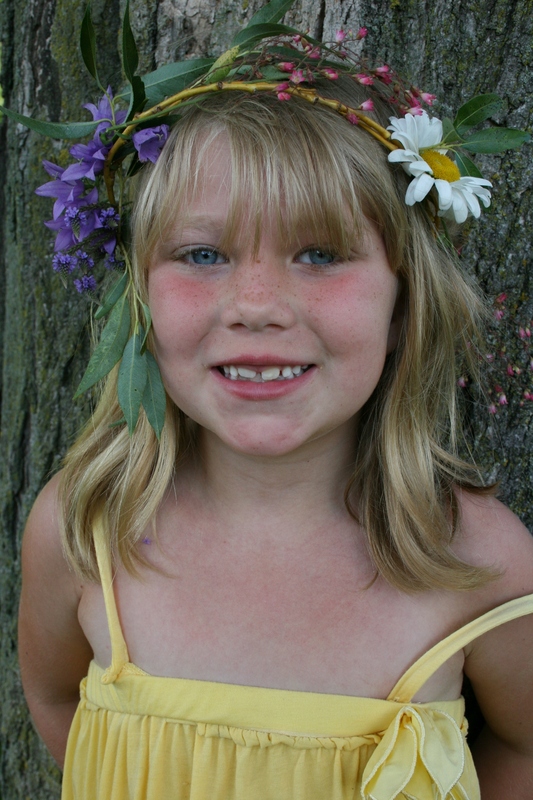 Seven-year-old Jordyn, who is part Scandinavian, part German, posed for photos after finishing her floral wreath. Bella, 10, tries on the wreath she just crafted. 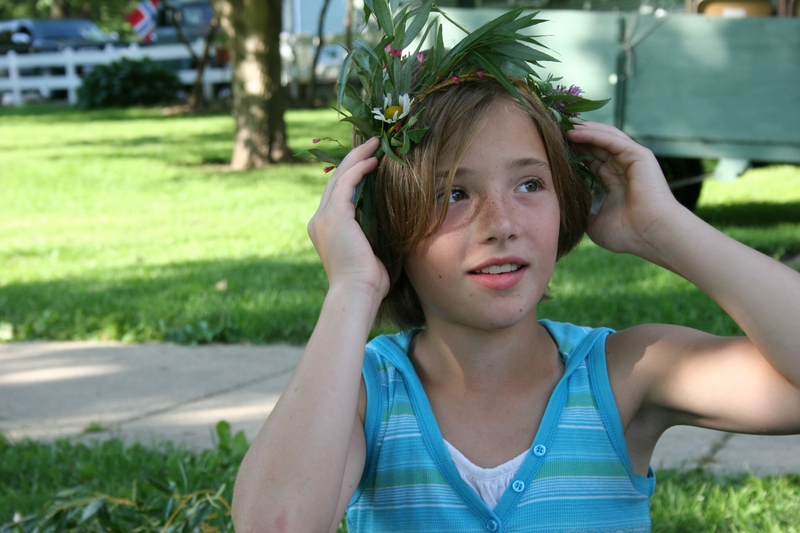 Grace, 9, creates a celebratory head wreath. 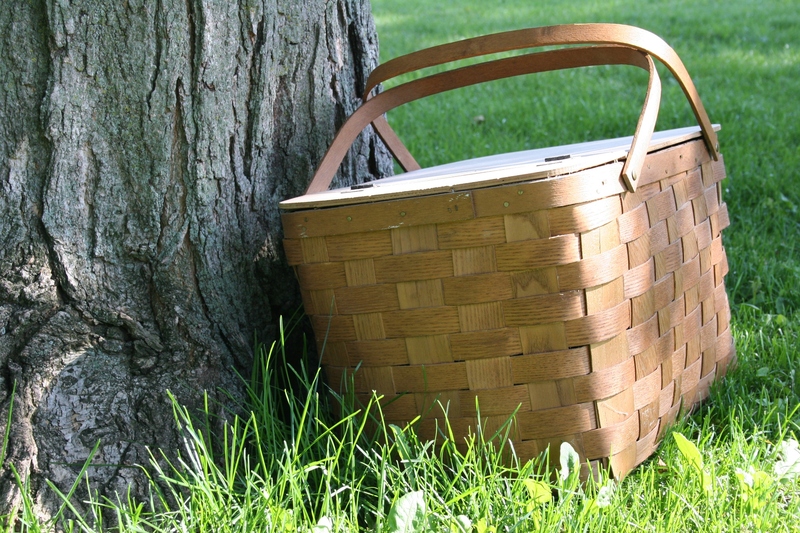 Midsommar celebrants arrived at Way Park with picnic baskets. 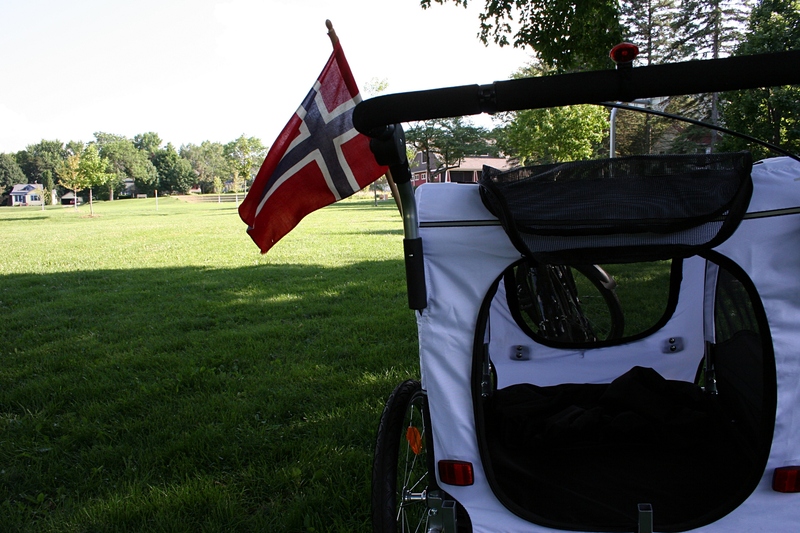 They arrived by bike and foot and in vehicles, proud of their heritage, as noted by this Norwegian flag on a bike trailer. 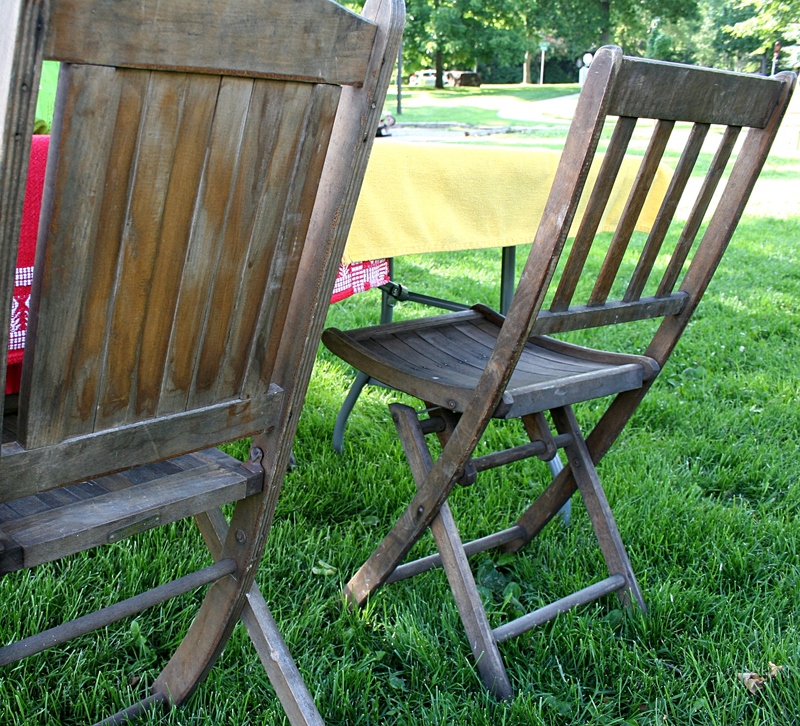 Even the old-fashioned wooden folding chairs had a Scandinavian connection. They were, I was informed, the chairs upon which attendees of the early St. Olaf College (a Northfiled college with a Norwegian heritage) Christmas concerts sat. 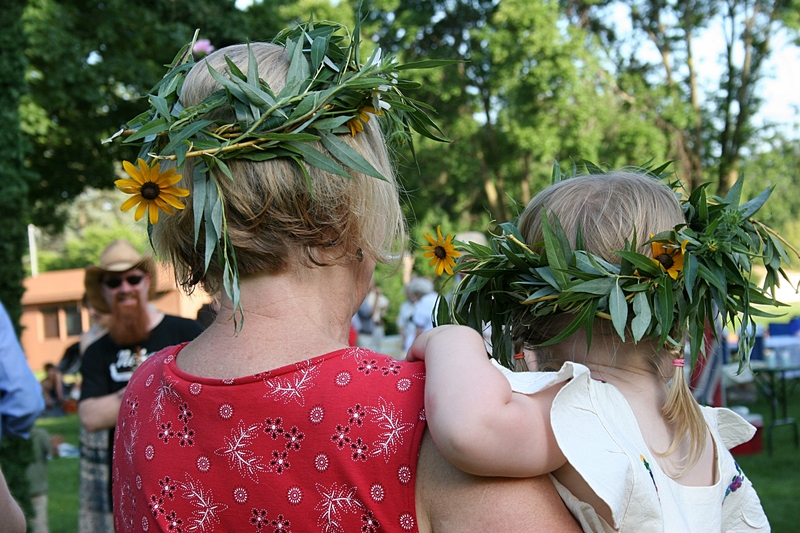 Wreaths and Midsommar, for all ages. 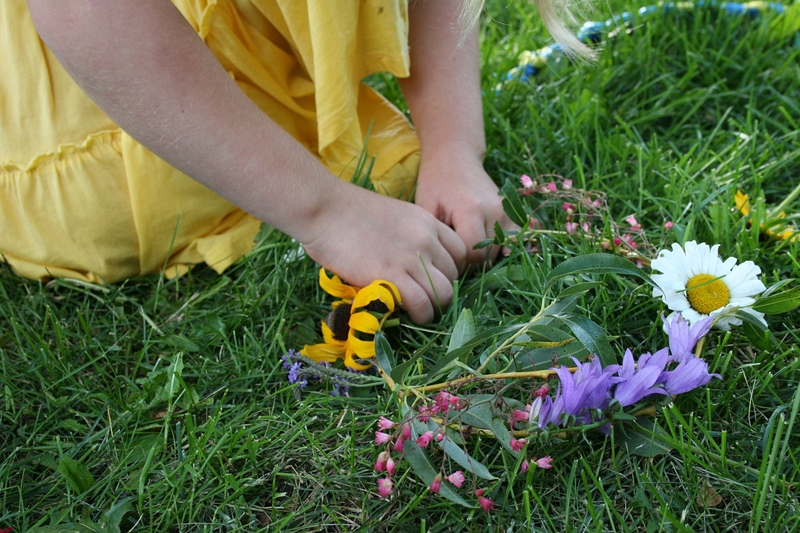 CLICK HERE to read an earlier blog post about Midsommar in Northfield.